This combines different filter sets for IC 2497 and Hanny’s Voorwerp, to give the best overall view in a single image. The Voorwerp shows up in [O III] and Hα emission, close to natural color were our eyes sensitive enough. 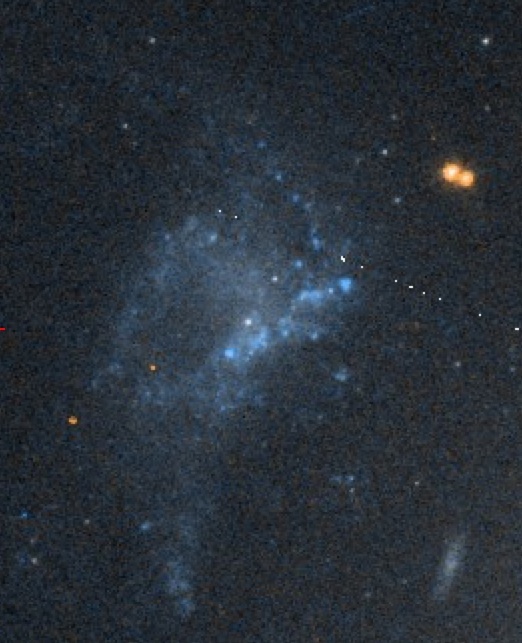 The galaxy IC 2497 is rendered from red and near-IR filters, so it’s a bit redder than we see in other images (for example, from the SDSS or WIYN data). 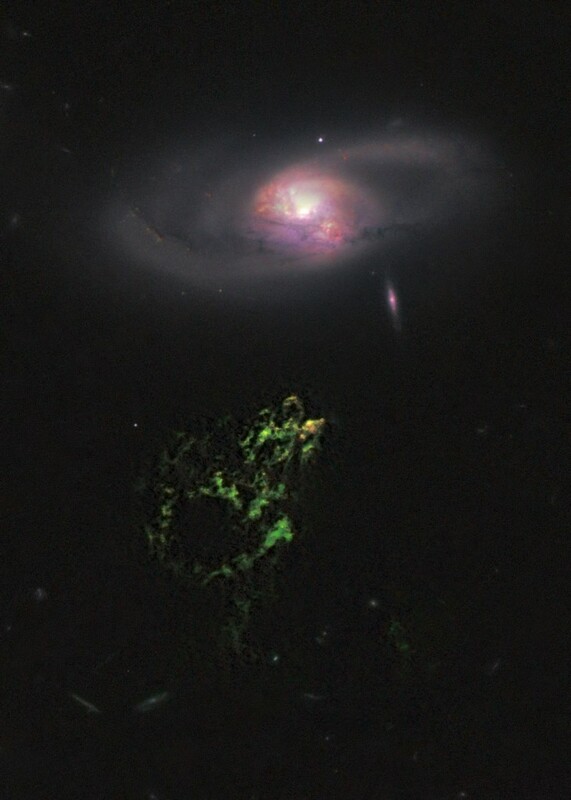 This version does a very attractive job of contrasting the two objects in both color and texture; for reasons you’ll read below, Zolt Levay and Lisa Frattare at STScI had a daunting task to make a single image look this nice from our disparate data sets. Looking back, we proposed these observations early in 2008, as it was just becoming clear what an interesting object the Voorwerp is and what the right questions might be. It was our good fortune that these observations remained relevant with all we’ve leaned since then, including radio and X-ray measurements. Each data set was specified with a particular goal as to selection of filter or diffraction grating, location, and exposure time. We had images and spectra, the latter looking for material very close to the nucleus of IC 2497 so we could zero in on what’s happening there with much less confusion from its surroundings than we get from the Earth’s surface. Full details of the observation planning appeared in this blog post after our proposal was approved. The released image product combines four filters and two cameras – the Wide Field Camera 3 (WFC3), installed during the 2009 shuttle servicing mission, and the Advanced Camera for Surveys (ACS), electronically repaired during that mission. WFC3 offers superior sensitivity and small enough pixels to exploit the telescope’s phenomenal resolution, while ACS has a set of tunable “ramp” filters that allow us to observe the wavelength of any desired spectral feature at a galaxy’s particular redshift. Our WFC3 images were designed to look at IC 2497, at wavelengths deliberately minimizing the brightness of the gas in the Voorwerp so we could also look for star clusters in its vicinity, that might tell us whether its gas came from a disrupted dwarf galaxy. (This turned out to be a good idea for a slightly different reasons). Our filter choices included one in the near-infrared, at 1.6 micrometers; one in the deep red, close to the SDSS i band, and one in the ultraviolet. Comparing these, we would be able to say something about the age of any star clusters we found. The UV image would also show whether there were any particularly bright clumps of dust, which could serve as “mirrors” so we could later measure the spectrum of the illuminating light source. Now, as proud as I am of fixing this all up, you don’t really care – you want to know what we’ve actually learned from Hubble. I’m with you – here goes! Stars are forming in a small part of the Voorwerp. We couldn’t see this from the ground because the regions involved are dim and blend with the overall gas emission. Hubble shows them in two ways. Our filters selected to minimize emission from the gas show bright blue spots, with the size and brightness of young star clusters, in a single area only 2 arcseconds long (about 2 kpc, 6500 light-years). Because the deep-ultraviolet spectrum of starlight is quite different than from an AGN, we see a second signature – the balance between light from [O III] and Hα tips in favor of Hα , again very different from the highly ionized gas elsewhere. In the picture at the top, that makes the star-forming regions show up as the reddish spots near the top bright region of the Voorwerp. These gaseous regions are likewise so small and comparatively dim that we couldn’t see them in even our best ground-based data. The hottest stars are so bright that it’s hard to tell how long these clusters have been forming stars; we know that they include stars so hot that they can be no more than a few million years old. It seems suspicious that we see these star-forming regions only in a small area, which lies closest to IC 2497 at least in our view (we don’t have enough information to be sure it’s really the part closest to the galaxy), and roughly lined up along the direction of outflowing material seen with radio telescopes. This all suggests that the star formation has been set off by compression as gas outflowing from the galaxy encounters the gas in the Voorwerp. We don’t see such star clusters anywhere else in the enormous trail of cold hydrogen of which the Voorwerp is the illuminated part, so their occurrence is connected to the Voorwerp specifically. This kind of event – an active galactic nucleus blowing gas outward and driving formation of new stars – is one form of feedback, connections between AGN and their surrounding galaxies that seem to be important in regulating aspects of galaxy evolution. We see this process in some other galaxies, in some cases much more intensely than in Hanny’s Voorwerp. A favorite example is Minkowski’s Object, a brilliant emission-line object near the radio galaxy NGC 541 at only a third the distance of IC 2497. In Minkowski’s Object, the central AGN is almost solely a radio object, without the ultraviolet output that ionizes Hanny’s Voorwerp. In that case, where we see ionized gas, it’s lit up by hot, newly-formed stars. This object lies right in the path of the jet of radio-emitting plasma from NGC 541, which is disrupted right as it reaches the object; this looks like a cloud of gas, maybe a dwarf galaxy, that was quietly minding its own business until it was hit by a flow of relativistic particles. Star formation is happening over regions of about the same size in both Minkowski’s Object and Hanny’s Voorwerp, but there are important differences: gas is shedding back away from Minkowski’s Object much more violently than in the Voorwerp, the radio jet in NGC 541 is much more powerful than the small one in IC 2497, and it doesn’t have the additional UV output to light up the gas which is not forming stars. The point I take from this is that the outflowing material reaches the Voorwerp, but with only enough pressure to set off star formation in the densest and closest parts, without the massive reshaping we see in some other galaxies. The Hole This is probably the most obvious structural feature of the Voorwerp (sometimes seen as the space between the kicking frog’s legs). We wondered whether it might mark the site of some kind of titanic explosion, the space where a jet from IC 2497 drilled its way through the gas, or even the shadow cast by some dense cloud close to the galaxy nucleus. What we learned on this was mostly negative – we do not see streamers of gas blasting away from the hole, or the ionization of the gas being any higher near it, as we would expect for a jet or explosion. The idea of a shadow still makes sense, but we’d still like to know more (maybe from some Gemini-North velocity data still being analyzed). Or maybe not so much dead as… transformed. The spectra also show something else that we didn’t know to look for. Only a half arcsecond from the core we see a second set of emission lines, redshifted by about 300 km/second from the nucleus. 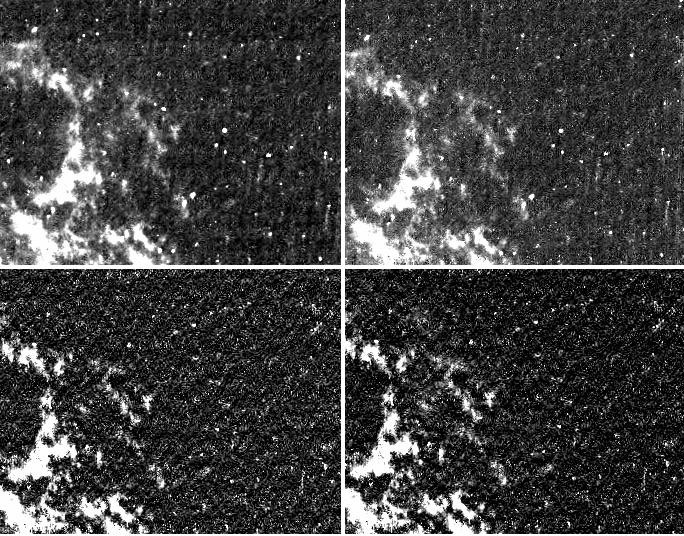 At this location in the ACS images, we see a loop or bubble of Hα emission. The nucleus has been blasting out material, driving this wave into the surrounding gas. Depending on whether it has been slowed down as it snowplows into these surroundings, and on whether it lies exactly in the disk of the galaxy, this would have started less than about 700,000 years ago. This was probably well before the nucleus faded, but connects to an intriguing idea long suggested from looking at the various kids of active galaxies. There may be two modes of accretion power – one in which most of the energy comes out as radiation, and one in which it emerges as kinetic energy of expelled matter (“radio mode”). Has IC 2497 switched between them almost as we watched? Here is that expanding loop. At left is the Hα image, showing it sticking out above the nucleus. In the middle is a broad-filter image taken to zero in the pointing to take the spectra – you don’t see the loop because it’s swamped by the starlight. At right, the spectrum near Hα showing the distinct emission-line clouds just above the nucleus. IC 2497 has had a troubled past. It looked a bit odd in our earlier data, but the Hubble images make clear how disturbed this galaxy is. Spiral arms are twisted and warped out of a single plane, and thick dust patches also show that it has yet to settle into a simple form after the disturbance. This looks a lot like the aftermath of a strong interaction – and since we see no other culprit nearby, probably a merger where the other victim is now part of IC 2497. The companion barred spiral just to the east (left) may be only an innocent bystander – it shares the redshift and distance of IC 2497, but is so symmetric and undisturbed that it’s hard to picture it being involved in a collision that wracked the larger galaxy (and tore loose 9 billion solar masses of hydrogen gas from somewhere). These dust patches, plus our better understanding of the Voorwerp’s continuous spectrum aided by the GALEX UV data, now suggest that instead of slightly in front of IC 2497, the Voorwerp is more likely slightly behind it, roughly over the pole of the galaxy. This means that we see the reprocessed radiation via the Voorwerp perhaps 200,000 years after it left the galaxy nucleus. Old news can still be very informative. Putting it all together, here is the sequence of events that we think led to what we see today. Perhaps a billion years before our present view (which is itself 700 million years behind the times, and there’s nothing we can do about the speed of light), a merger led to IC 2497 forming from two progenitors, with its disk slowly settling but still warped. One product of this merger was an enormous tidal tail of gas, which came to stretch nearly a million light-years around IC 2497. During this process, material accreted into its central supermassive black hole, rapidly enough to produce the energy output of a central quasar as a byproduct, and illuminating and ionizing gas that was exposed to its radiation, to make the Voorwerp. About a million years before we see it, it started to blow material away (and this may have been when its radio jet and outflow started). Then, later still, the core faded, maybe as its energy output switched from being mostly in radiation to mostly powering the motion of material out of the galaxy. And now we see Hanny’s Voorwerp as a very lively echo of the past, as the last radiation from the fading core aces outward but has yet to complete the zigzag trip from galaxy to Voorwerp to us. AWESOME! Bill thanks for all your hard work on this. Thanks a lot Bill and your team for your great efforts in solving this mystery. Thanks Bill. It was also really interesting to hear how the image was processed. Great link to the voorwerpjes work. Well done! I started to edit and found that someone had already fixed the typos. Thank you, masked editor! An excellent write – up Bill. So what actual use does knowing all this do us earthlings, besides having this esoteric information? What can I/we do with it? Why pay millions to find this stuff out? Why?